After opening a FastSaver account with CIMB 6 months ago, I can say I am a satisfied depositor. I took home a good $10 cash gift. I shared that happiness with my family and friends. Of course, some scoffed at the promotion and interest rate. I tried to convince them. I failed. That's alright. They are happy with POSB. Probably they didn't understand inflation. They didn't think $10 is worth the simple 6 steps process. In this 6 months, the coffee prices increased by another $0.10 at a nearby kopitiam. Just last month, one of my army mates got really interested and opened FastSaver too. He told me about this promotion for another CIMB account. 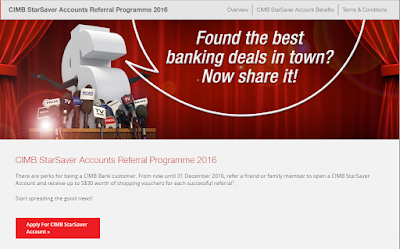 CIMB StarSaver is offering 0.8% if you maintain $500 of fresh deposits. I assume the promotion is to get some people to sign up for StarSaver since FastSaver is presumably the better option here to a new depositor with no conditions. I could be wrong on this, though. Do your own analysis. Anyway, he got his interest from FastSaver for the first month which was around $7 more than leaving that same money in POSB. The difference in interest can now buy 10 cups of kopi in the camp's canteen a month. Over a year, that's 120 cups of kopi. This month, I decided to set the FastSaver account as my emergency stash. With FAST, the transferring of money was easy. It will net me about 3 extra dollars in interest. Again, not much right? Over a year, that's $36. Not too bad. Of course, I am still losing the game to inflation. Back to the promotion. Share the love!